Double parking and worn out markings plague the Hudson Street bike lane. The full board of Manhattan Community Board 2 voted unanimously last Thursday night to endorse a community-generated plan to convert the buffered bike lane on Hudson Street to a parking-protected lane. The new protected lane would extend the protected Eighth Avenue bike lane down to Canal Street and the Ninth Avenue bike lane to Bleecker Street. The Hudson Street bike lane is one of the oldest buffered bike lanes in the city, and its faded stripes are often blocked by double-parked vehicles. The lane is wide enough that it could be upgraded to a protected bikeway without removing a travel lane. Parking would only need to be eliminated to install pedestrian refuge islands, popular among local residents, and mixing zones at intersections. The resolution asks DOT to return to the community board with a plan to upgrade the lane. We’ve come a long way! Congrats to CB2, you’re going to be quite the bike friendly neighborhood soon. Congratulations Ian and CB 2. Ian you are too awesome to retire from the CB. Your fans love you. The president of the SoHo Alliance is down on his knees, tearing at his hair and rending his garments. Congratulations to CB2 and Ian! DOT should paint this bike lane again before they install the protected lane. If they don’t, guys like Sean Sweeney will honestly think it’s a new bike lane. And thanks to the folks who’ve commented. I guess the word has spread that very shortly I’ll be a resident of Brooklyn CB6. I really don’t see this “win” as a us-vs.-them or me-vs.-him, and by and large my CB2 colleagues really see the benefits of these projects. I’m quite sure that without me, they’ll continue supporting the positions I’ve been advocating. Not to diminish the efforts of our former Manhattan Community Board 2 member but CB2 must be one of the most bike-friendly community boards in the City and clearly has more miles of bike lanes than any other Community Board. 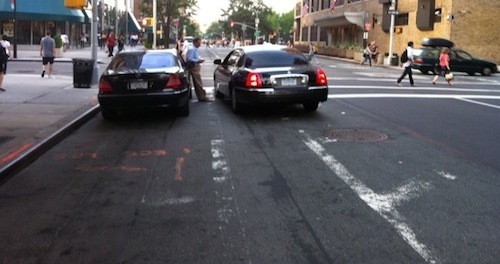 It still contains at least one of the older narrow ride-in-the door zone lanes along Sixth Avenue. So the goal at this point should be to maintain existing lanes where paint is wearing thin, and recognize lanes that can be upgraded to either fully protected lanes, or at least buffered lanes. It’s all well and good to have a brand new parking protected lane on Hudson Street but let’s not forget the Grand street bike lane, which is nearly non-existent in some sections due to sloppy street work and neglect. Great plan! I’ve had so many problems biking down Hudson on my way to Bleecker… it’s very dangerous! Thanks, CB2! @twitter-19831590:disqus Good point about Grand Street. It’s a disaster, yet a ton of people use it or try to use it every day. It definitely needs something, because the situation is ridiculous and has been going on for a long time now. As for upgrades, a lot of people have been calling for Lafayette to be converted to parking protected. I think the most pressing location is between Spring and Reade. In light traffic, cars use this as a raceway, but when it is congested, I’ve seen streams of cars drive in the bike lane, which is really dangerous. @Uptowner13:disqus Yes upgrading the Center Street/Lafayette Street bike lane would be a real plus since its a major route for cyclists coming off the Brooklyn Bridge. It’s particularly dangerous between Broome and Spring where the street narrows and the pavement is so bad — even sharrows would be an improvement in that area. Sorry my response was intended for J. Don’t know why it changed to Uptowner13 when I hit the post button. Yes, a two way parking protected lane on Lafayette would go a long way to closing a gaping hole in the bike lane network. I am in favor of upgrading a bicycle lane so the cyclist would be safe.